The B4rn FAQs & Set Up Guide. The Broadband 4 the Rural North (B4rn) pronounced Barn is broadband provider using fibre to deliver internet speeds up to 1 gigabyte, this includes both download and upload speeds. 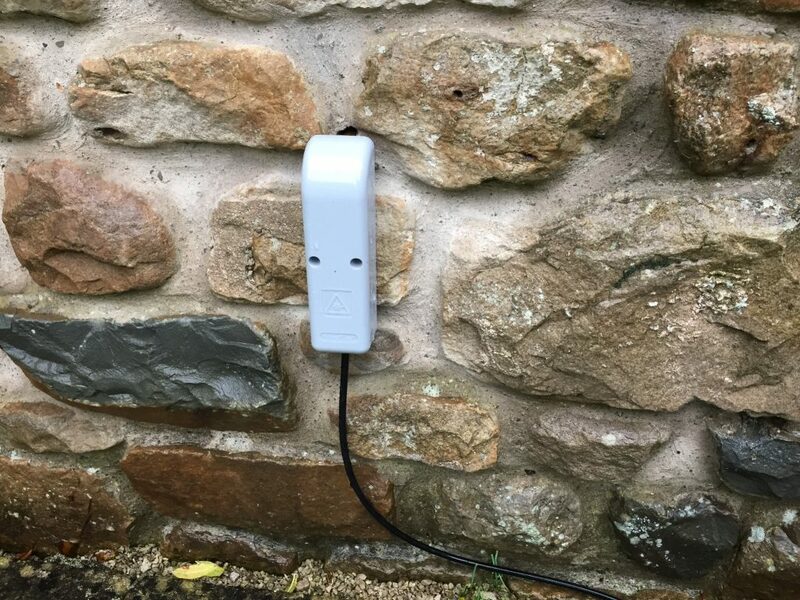 The B4arn is now getting installed in properties in Ingleton and surrounding areas. This quick guide will help anyone wanting or considering B4arn, it will help you plan and get up and running with B4rn as well as understanding what to expect from your hyperfast internet connection. You will need to know where your fibre is feeding into your residential area e.g from the road or adjoining field. One of the differences with B4rn is that it does not follow the usual routes of other services e.g BT, Gas, Electric. The fibre is mostly dug in by volunteers and the route is often decided by agreement with land owners. This often results in the fibre running through fields and gardens as these are easier to dig than running it under pavements and roads. This is also true when planning the access to your property, paving slabs can be lifted easier than digging up the tarmac. Lawns,turfed areas and flower beds are great routes, turf can easily be lifted and relaid and will look as good as new in a few weeks. Talk to the B4arn champion to find out where the main feed is coming from and you can then plan where the fibre would best be laid across your property to the entry point of your premises. B4rn should be contacted to find out who your champion is. 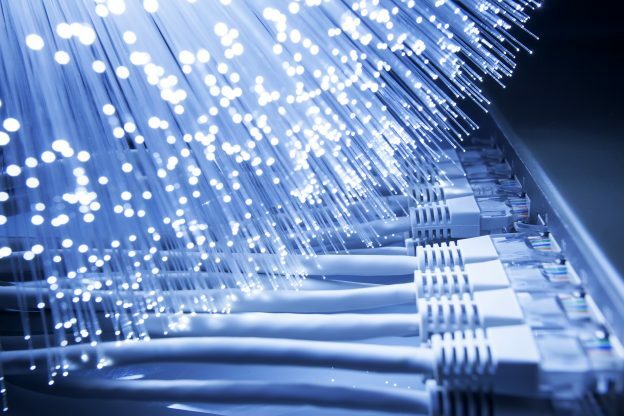 The fibre is laid or blown more accurately blown through Orange cables that are connected to black cables once at your property wall. The black cable shown in the picture below is connected to a much narrower white cable in the grey box, this can then be routed to connect to the WiFi/fibre router. The router does not have to be directly behind where the fibre goes into your home, this is only the entry point. My router is 3 meters away from the entry point into the house. 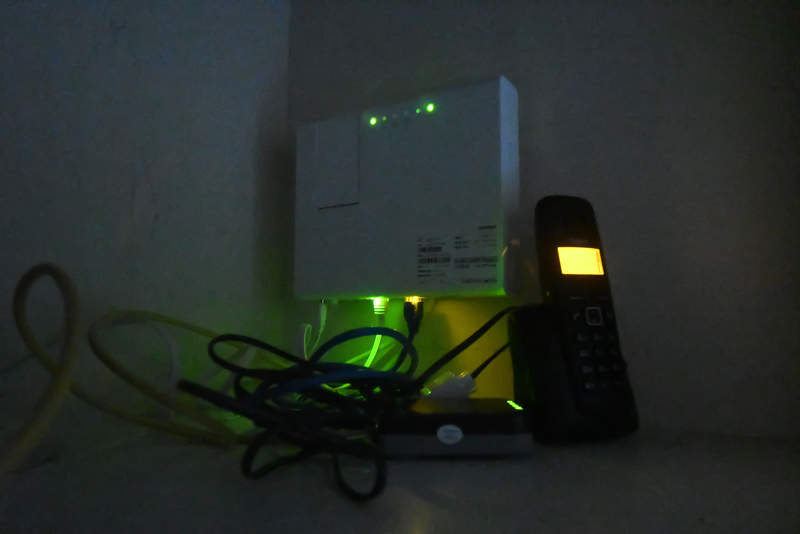 It is connected from the entry point on the wall to the router using thin white cabling supplied by B4rn. The router will need an electrical power supply, it is plugged in using a three point plug. If using a VOIP phone you will need an extension lead or a further two powerpoints. The router is wall mounted, it stands out from the wall for approximately 2 inches (5cms). The router has constant flashing green lights! The green lights are quite bright and are on the front and beneath the router. This may be annoying and may cause problems with sleeping if is mounted on the bedroom wall! The router isn’t pretty! It’s a box measuring 8 inches by 7 inches and lights up like a spaceship! For fastest connection you will want to plug in an ethernet (also known as network cable) this will run from the router to your computer so close proximity or an easy route for the cable is a good idea. The router has limited reach for wifi, so if the router is at the front of the house you may not get wifi at the back or upstairs (mine reaches approx 15 meters through thin plaster board walls). If you are going to use a VOIP (internet telephone) you will need a three point plug for the router and and your phone. The VOIP box will be plugged into the router (see more on VOIP below). B4rn will blow the fibre and make all the connections up to the router on an agreed date. Once you have had the router installed you will want to connect your media devices to the router. If you have a Genexis DRG7820 will know when the router is live by the flashing light on the front of the router. When it’s live you will have three lights on the front of the router one of which flashes. 1. You can plug a ethernet cable into the router and into your device (this will get you the fastest download and upload speeds). Ideally you should have an ethernet cable of cat 5e or above. The cat of the ethernet cable can usually be seen on the sheaf of the cable near to the connectors. 2. Use the WiFi to connect. If you have mobiles, tablets and WiFi printers then you will want to connect using WiFi. 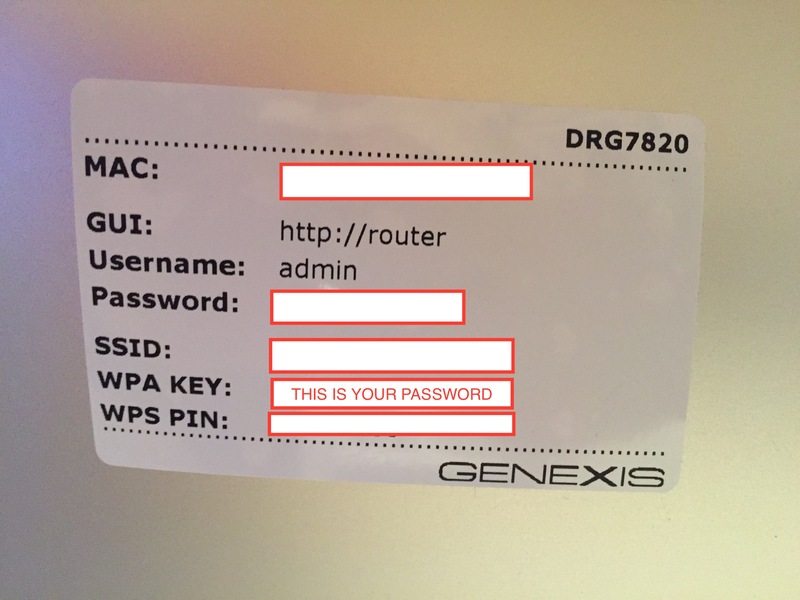 Connect using the usual way for your device, the wifi password on the Genexis router is actually called the WPA key, this can cause confusion as the label also has a ‘password’ field which is only used for configuration purposes. So when connecting your device it will ask for password but you actually enter the WPA key. The router has a label on it showing the WPA key. All being well you will now have connection. So how fast is your connection? There are a number of speedtest tools available on the internet, many can be used using the browser however the b4rn is so fast I would recommend that using the app on speedtest.net will give the more accurate results, there are apps for desktop as well as mobile devices. The result I get using an ethernet connection with a cat 6 cable is shown below. When using the in browser speed test apps (including speedtest.net) the results are very inconsistent and the download and upload speeds vary drastically, hence best use the apps. Why B4arn speed isn’t as good as advertised? As you can see from the above speedtest the B4arn is hyperfast and nearly gets the 1gb advertised rate. The above test was carried out on an Apple Imac with a cat6 ethernet cable. However a lot of media devices will not be capable of keeping up with the speed particularly when trying to connect via the WiFi. This is due to the device rather than the B4rn connection. My personal opinion, the routers are not that great for WiFI, they seem to have a lot less reach and certainly not as good as the BT hub, however for ethernet connection it really does perform. 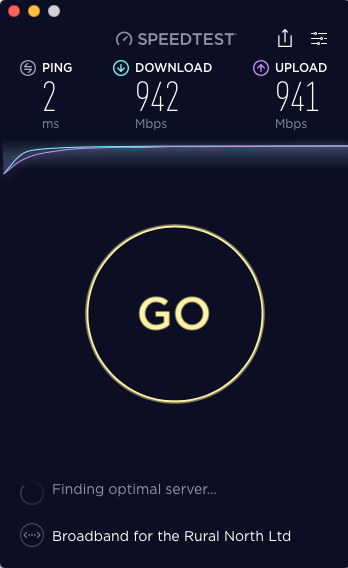 That being said, when you do connect via wifi it far outperforms any other provider. So what are the benefits? You will get more stable connections when viewing streamed services such as BBC iplayer and the ITV hub (no more buffering). The real benefit is when uploading files. Part of my work is taking sports event photography. I can take 1000 or more photos at some events and these are then uploaded to my racingsnakes.com website for the competitors to buy and download. Each file can be 10-15 mb in size. The process was taking hours with BT infinity, it now takes minutes – thank you B4arn! Some websites will not load quicker than with your old Internet provider, this again is due to the servers the website is using to host the website not the connection speed of the B4rn. A good site to test for excellent connection speed is the BBC.co.uk. you should get more or less instant browsing on their website when connected via the B4arn. VOIP means you can ditch your BT landline. Instead of using the BT line you simply use the B4arn fibre for making and receiving calls and much more. You can transfer your existing BT number to the VOIP service but before you do so you need to make and receive a call using the VOIP line before cancelling with BT. I went with Vonage, they have a few options starting from just £8.50 month and this also allows you to divert calls and make calls from your mobile as well. Order Vonage using this link and get a £50 Amazon gift voucher when you sign up. To set up VOIP you need a VOIP phone, these are very affordable and some packages from Vonage include them when you sign up. Once you have the VOIP phone you simply plug in the VOIP box into the router and the phone into the VOIP box. You will to also plug the VOIP box into a power socket and also the VOIP phone base station. This means you will need the following plugged into power supply in close proximity to your router. The VOIP phone base station. If like me you have put the router in a cupboard the base station will only serve as a slave for the other phone (you get two phones with the Vonage package). This isn’t a great problem as it’s really easy to set the calls on Vonage to also be received on your mobile (even when you are not at home) so I just answer call on my mobile. The above was put together from my experience. Please let me know of any tips that you think should be added to make life easier for those about to join. This entry was posted in B4arn internet and tagged b4rn, hyperfast, internet, user guide on October 11, 2017 by Mick Kenyon. Muse vs WordPress – Which is Best? Aden Clark on Google+ the best marketeer?